Let’s take a minute to really swoon over our furry fur babies! I love to pamper our pets, and I am all about making homemade cat treats, toys, and more. Nothing says I love you more than a homemade gift. So why not carve out some time in your schedule and make some special gifts for your cat to show them you care. 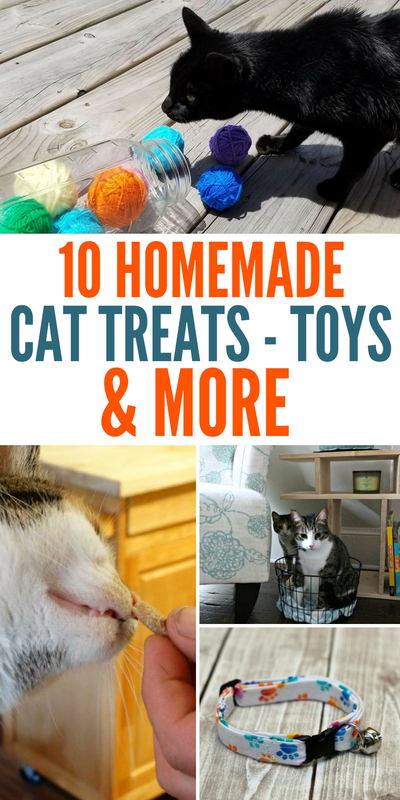 I have recipes for homemade cat treats, DIY cat toys, and so much more. You will tons of great ideas to try out and see how your feline likes them! We actually just added a few new additions to our family today! We picked up 6 guinea fowl birds. After doing some research we learned they are great for eating ticks, spiders, and other bugs around the home. Since we have over 20 acres of land around our home, we thought they could really help. They even can kill small snakes or create a special call that lures all the other birds to kill a larger snake. This is good for areas that have poisonous snakes. I am hoping and praying that the predators don’t come and get them! We have them locked up for around 4 weeks before we can let them roam. Soon I think we are considering getting a few more cats to add to our home. We are still struggling with whether or not to add new cats to our home. It is hard after we lost our other cats, but I think soon we will try again. Clay still loves his cats, and anytime we see one somewhere he says, “Cat, me, home” like he wants to bring it home. If it were up to him we would have thousands of cats! Enough chatter, here are some great ways to pamper your four-legged cats this week! 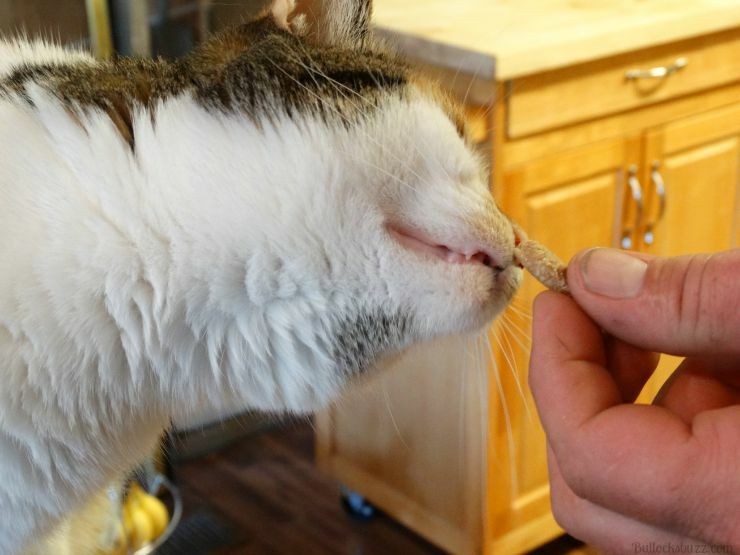 Here is some homemade tuna cat treats that will make your cat go bonkers everytime you open up the container to give them one. What cat can resist the aroma of tuna? 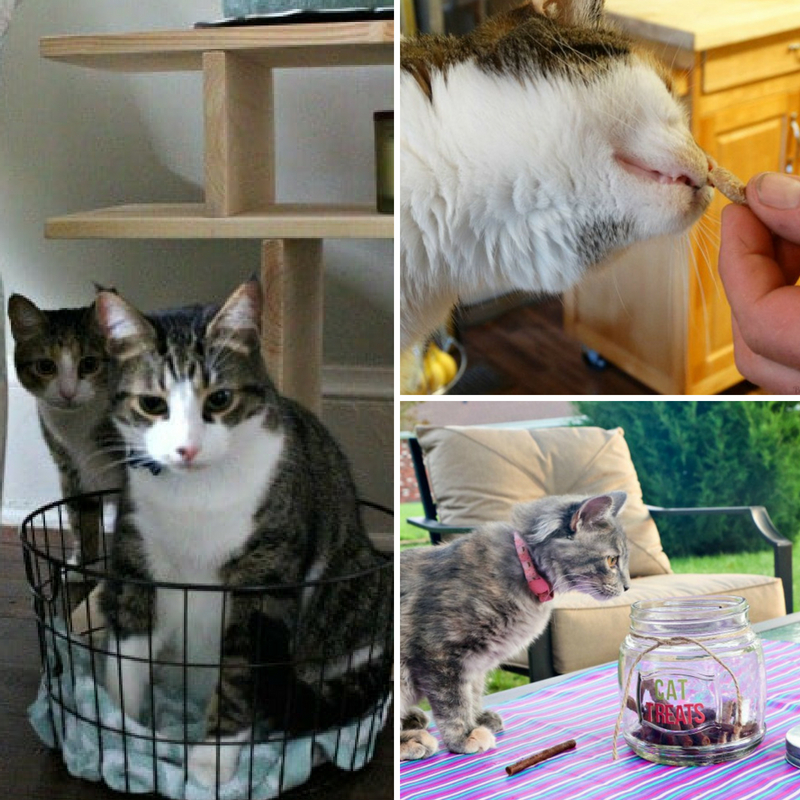 Learn how to make a DIY cat treat jar to store your homemade or store bought treats in! A cute way to display your cat treats on the counter in your kitchen or even hall. 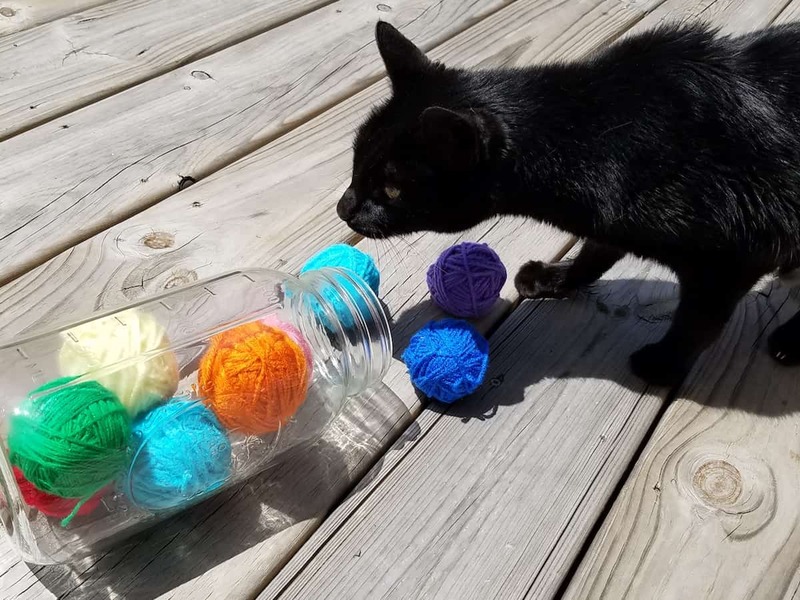 Check out this easy cat toy that requires no sewing! You can make a toy that your cat can bat and pounce on and burn out any energy they may have! Here is another cat toy you can make. This one is a Halloween inspired cat toy, but you can’t won’t mind playing with it any time of the year. This is a great idea on how to make your own cat scratching post in your basement or in any area of your home. Grab a few supplies and within an hour or so you have a DIY scratching post. Learn how to make your own breakaway cat collar for your feline. 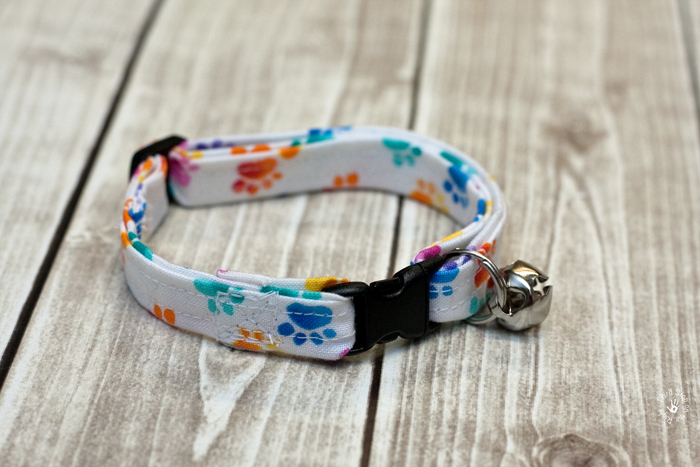 Grab your sewing machine, thread, and some fabric and create a really cute and affordable cat collar. I love this cat stick for your cat to nibble on, kick and wrap their legs around and play. Very easy to make, affordable, and takes minimal time to do. Take old baby socks and transform them into cat toys! A great way to recycle your baby socks in a way that gives your cat some enjoyment. Learn how to make a simple DIY cat bed that will fit any color scheme of your home. 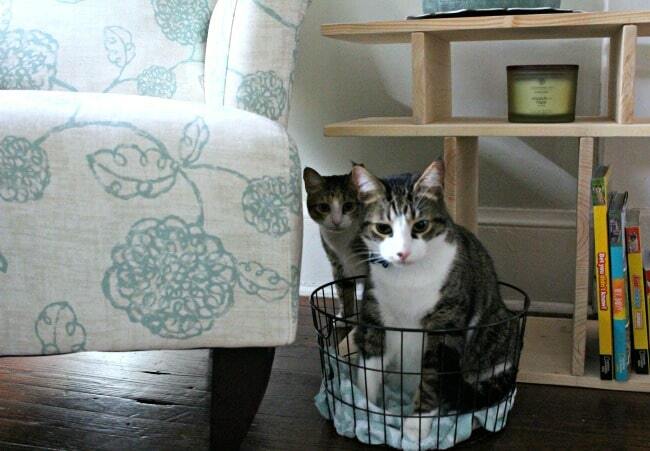 I like the idea of this really quick no fuss cat bed idea. You can even make homemade cat shampoo for your cat or dog. This is good for either, although it can be a struggle for most cats to be willing to take a bath! Have you made your cat homemade treats, toys or something else? If so what was it? !